John was born in 1818 in Tennessee. He married Mary Catherine Fields. She was born January 12, 1824 in Tennessee. 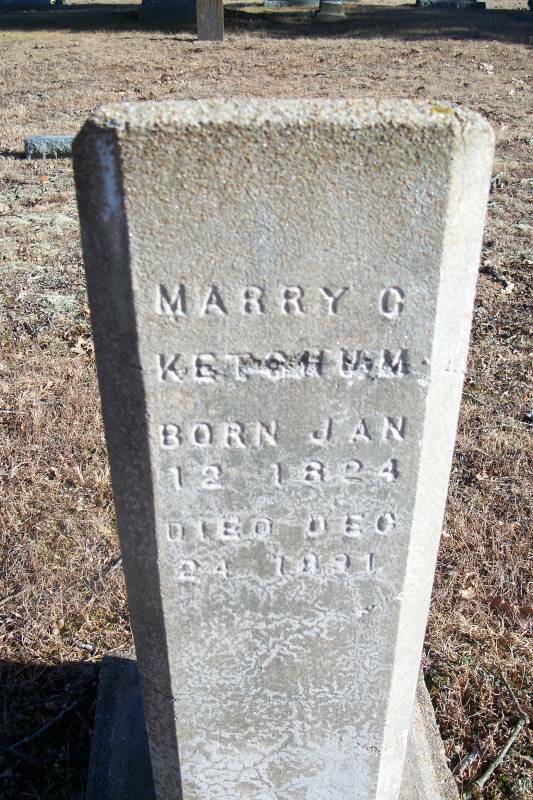 She died in Phelps Co., Missouri on December 24, 1891. She is buried at Morrison Cemetery, Salem, Dent Co., Missouri. John died on December 23, 1862 in the Sandusky, Erie, Ohio, Union POW Camp. John fought for the South but probably not as an enlisted soldier. Thus the designation of bushwacker by the Union. John Ketchum, Bushwhacker, captured Phelps Co., Mo, residence Phelps Co., Mo, captured July 18, 1862. Taken from Gratiot St. Prison to Alton, Ill prison Sept 12, 1862. Sent to Sandusky, Ohio prison Nov. 14, 1862. Reported as having died on Johnson's Island, but the grave was not located. A number of graves in the Confederate POW Cemetery are marked as 'Unknown,' and it is thought they are graves of these particular dead, as the number not identified is practically the same as the number of graves marked unknown. 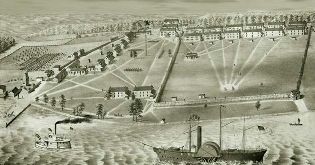 Dr. David Bush, Professor of Anthropology and Director of the Center for Historic and Military Archaeology of Heidelberg University oversees the research and history of the Johnson's Island Civil War Prison in Sandusky, Ohio. I contacted Dr. Bush and he sent a certficate of prisoner record which gave more information about John's stay at Johnson's Island. The certificate is below. I have begun research on the 15th Missouri Cavalry that the certificate states John was a soldier, but I haven't been able to locate any information at this time. My blog post. "Let Me Tell You a Story" (link above) dated April 6, 2018 contains an account from another prisoner who was at Johnson's Island in the same time period as John was that gives the reader an idea of what John experienced while he was a prisoner. ​"Missouri was one of the few states that declared itself neutral and refused to participate in the Civil War. Then the Union army came in and ordered the men to enlist or have their farms burned, even death. The Jay Hawkers would ride in and do unmentionable things and if they fought back they were arrested as Bushwackers and executed, because they wore no uniform in a neutral state. That is just so wrong!!! 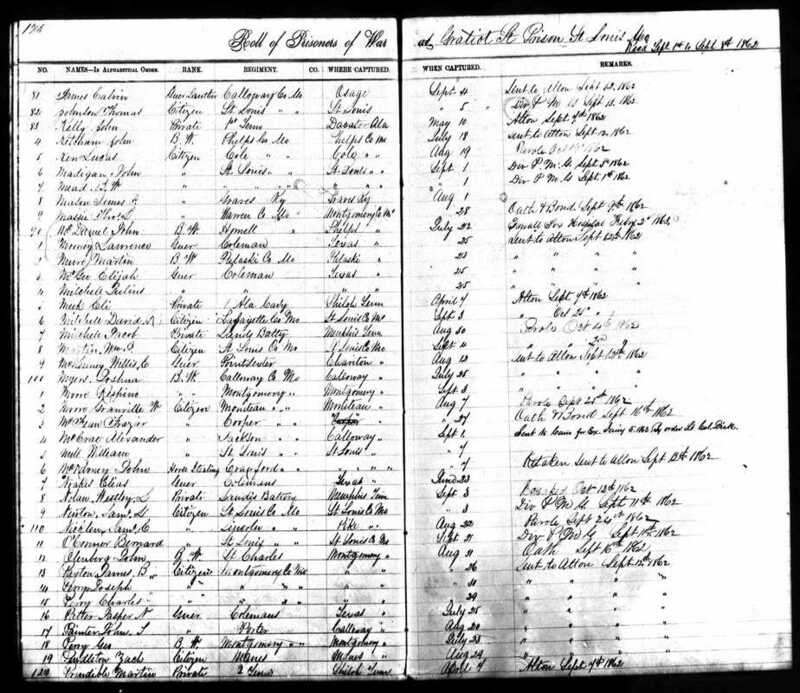 My ggreat grandfather John Ketchum was executed just before Christmas Day leaving behind a wife and 11 children for simply trying to protect his family. Funny even my Dad would well with tears as he told the story and his anger never dissipated till the day he passed on and here I sit still obviously angry myself to post this."